The term electrician is not foreign to anyone. It is familiar and self-explanatory. Electricians are professionals who install, repair and maintain different equipment, fixtures and electrical wiring using power tools and hand tools. They also constantly ensure that everything abides by relevant codes. They test out the electrical systems and make sure that there is continuity in circuits in not only electrical wiring but also fixtures. They usually do this using testing devices such as test lamps, oscilloscopes and ohmmeters and ensure both safety and compatibility of the system. Their job description also includes using a range of tools and equipment like testing equipment and power construction equipment. The nature of their job can be quite risky as well as electricians are often required to climb unsupported ladders and risky roofs to fix electrical wiring and fixtures. Another key responsibility would be to guide and train subordinates how to carry out install, maintain or repair work. Problem solving is a key aspect of the profession they are expected to formulate ideas and solutions to problems on a daily basis. When in meetings, they must carefully listen and understand what others say in work meetings because if they cannot envisage the problem, providing a solution will be difficult. Professionals in this industry can visualize how electrical components are assembled and organized. According to government regulations, it is mandatory that all electricians should have identification cards and current licenses. -	Perform different business management duties like organizing records and files, making reports and ordering equipment and supplies. To excel in any career, it is important to be reliable and dependable. In addition to these qualities, you must possess dexterity, creativity and strong work ethics to become a good electrician. If you live in Arizona and wish to pursue this career, you have many options. However, before you enroll into training programs and apply for licensure, do proper research and find out whether this profession is the right fit for you. After you decide that this is the career of your choice, you can proceed to get education an experience as a basic electrician. However, there is also option to specialize. You may attend specialized electrician courses and become a wireman, outside lineman, installer technician or a residential wireman. Irrespective of which you choose, you will be required to complete apprenticeship program in specific field after graduation from accredited training program from a reputed institute. There is no denying that working with electricity can be very exciting. It is also very true that the task can be quite dangerous at the same time. In addition to this, there is massive competitive to secure a job-paying job for electricians. These are perhaps reasons why most relevant programs put the students through a detailed and rigorous curriculum. At school, you will not only be expected to master the required basic skilled but the you will also be asked to perform certain jobs effectively. You will have to familiarize yourself with all the industry codes and learn what the best practices and procedures are. You will be asked to learn a range of other information, which are important because you will have to use them on a daily basis while working. Another motivation to learn them well is these will be included on your licensing exam, without passing which you cannot start working. Most electrician training programs cover safety related topics first because it really is the most important issue in this line of work. Electricians have to deal with very high voltage power lines and conductors. This can lead to severe injury and can even lead to death in safety procedures are not followed religiously. Under safety awareness, you will be taught what safe jobsite practices are, what are the dangers of electricity, how to identify hazards and how to effectively maintain a safe work environment. Basic first aid and CPR training will be taught as emergency procedures. Emphasis on OSHA and EPA regulations will be given as well. This includes general jobsite requirements, AEG and GFCI usage guidelines and procedure for using MSDS sheets to recognize and handle dangerous materials. There will be courses to introduce you to the different tools and materials that are used in this industry. You be taught how to handle and use them. The training will focus on reading meters, using hand tools, to operating platform lifts and other motorized electrician tools. In tool management courses, you will get an overview of hand and power tools. You will be taught to identify defective tools and implement safety techniques in addition to learning how to use and maintain the tools. Rigging will teach you technique of rigging and hoisting, and also how to tie proper knots. In digging classes, you will learn digging, grading and leveling techniques. There will be courses to teach how to use platform lifts, bucket trucks and truck-mounted cranes. Finally, you will also be taught how to identify, choose and use common materials correctly. Ability to use mathematics is an important part of any electrician’s job. So, you must pay attention to the math classes. Most of the math applications in this industry involves solving for unknown variables. You have to project proficiency with numbers during different calculations. These classes cover basic algebraic formulas, standard arithmetic, use of fractions, use of decimals, basic trigonometry, square roots, ratios and percentages and direct and inverse relationships. You need to have a good understanding of electrical theory as most of your job is about it. The theories may vary depending on which specific field you will work in. You will learn about terms and units of measure, electrical current, electron flow, magnetism and electromagnetism, Superposition, Ohm’s Law and AC Theory as basic education. You will be taught the different types of circuits (series, parallel and combination). In classes on voltage, you will get an overview of polarity of electron flow, distribution of voltage and proper wire sizes. Finally, the curriculum will teach about the three-wire systems, three-phase systems and electronics. 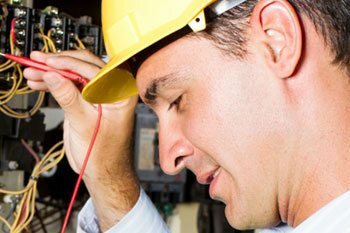 A certified electrician can conduct both installation and repairing of electrical systems. In order to apply for any of these licenses, you must have 4 years of prior work experience as journeyman or higher, 4 years of W-2s and verified participation in minimum 8 maintenance project and 7 new ones. To get this Arizona license, you will have to form a business entity, which mean you will need company name. After the company name is approved by Registrar od Contractors, you can communicate with the Secretary of State or the Arizona Corporation Commission to discuss the type of business entity you wish to own. They will then offer guidelines of forming the entity. After the business entity is created, you have to get a Transaction Privilege Tax Number from the Arizona Department of Revenue. Get your Employer Identification Number from the Internal Revenue Service. The next step is to obtain the right bond. Before you apply for the contractor’s license, you must pass 2 examinations: A Business Management exam and a Trade exam. It is important to prepare well because if you fail 3 consecutive times, you will have to wait more than 180 days to sit for the exam again. You will be eligible to sit for these certification exams only after completing a specified amount of training hours. This can be attained via previous work experience of by attending an apprenticeship program. In Arizona, you might be asked to show proof that you have received formal education in relevant field like electrical technology. Upon receiving the license, keep in mind that Arizona does not accept electrician licenses that have been issued by other states. Also, you must renew your C-11, L-11 or K-11 license after every 2 years. Always ensure that your license is renewed and updated. So much importance is given to certification and licensure process to protect the public health and ensure safety. It enables both customers and employers to be sure that they are dealing with a person who possess the right qualities and professional standards set by the industry. If you are a license holder, it communicates to everyone clearly that you are competent and can perform assigned tasks in a safe manner. Do not take your responsibilities as an electrician lightly. The state does not allow anyone without a license to work professionally. In fact, even employers who hire non-licensed individuals are penalized. It is not worth taking a short-cut to success by risking your future. Average annual salary of entry-level electricians in Arizona is over $36,000 while the average national salary including bonus is around 45,000. The base salary is $44,801 and bonus of $685 is provided. The total national salary sums up to around $65,000 as electricians get many benefits such as social security, 401K/403B, disability	, healthcare, pension and time-off. It largely varies depending on several factors. For example, mean yearly payment for electricians is $43,815 in Avondale, Glendale and Phoenix, $38,148 in Flagstaff and $43,524 in Tempe. When it comes to determining how much your salary will be, obvious factors such as expertise, education, the nature of job and employer comes into mind. However, there are many other determinants that need to be considered. It is expected that your level of experience will impact your pay scale. The more expertise you project at what you do, the more fee you can charge for your service. Your fee also increases as the number of years of experience increases. As an electrician, you can work in different industries such as building equipment contractors (where most electricians are employed), local government, employment services, non-residential building construction and utility system construction. Payment depends on which one of these you work at. Note that people working in local government and utility system construction get higher salaries than those working in other industries. Just like any other job, location is a big determinant of salary. Depending on whether you work in a metropolitan area of Arizona or not, payment will vary. In fact, salary of individuals who have similar credentials and experience, and work in the same industry can differ as much as $20,000 only because of location. Finally, whether you are union or not is also a factor that is considered. Union electricians are paid higher salary. They get more benefits on-the-job than any of their non-union counterparts. There are several ways in which you can maximize your salary but the best technique is to get more training. There is a clear relation between the amount of education you attain and the kind of certifications you have with how much money you earn. For this reason, your aim should always be to get additional training as an electrician. You can specialize in your field and always stay ahead of the competition. The career as an electrician is very rewarding if you have the right set of qualities that employers and clients seek. As mention before almost all employers will require that you have complete your training from a trade school and currently hold your State Apprentice Electrician’s License in Arizona. Besides the required training below is a list of other things you should possess before applying for a job. 1. Driver’s License: Not only is a valid Arizona driver’s license required but it needs to be clean without too many speeding tickets or major infractions. Because it is possible you’ll be driving a company car your new employer will want to make sure you are a safe driver. 2. Foreign Language: In Arizona, especially in the Phoenix metro area it is important that you be bilingual. English and Spanish are preferred by many of the job postings we saw but don’t sending in that application if you don’t know a foreign language. 3. Other Experiences: Do you understand lighting? How about solar or even HVAC? These are areas to make sure to put down as a skill as you might work for a company who hires electricians who also server a dual role in the company. In Arizona solar is becoming a very hot career path and many electricians are moving over and working for solar companies and using the electrical experience they learned while on the job as an electrician. 4. Extra Hours: Especially when you are brand new as an electrician many companies will want you to work extra shifts, 12 hour days and even weekends and holidays. Because you’ll be new it is best to just put on your resume you are available to work anytime, including holidays. This will put you ahead of other electrical graduates all trying to get the same job. When looking for a good electrician trade school in Arizona you need to find one that is 100% hands-on as we don’t know of an online program where you’ll get the necessary experience. Below are just a few schools we know of to research. The college offers a program at their Washington Campus at 108 North 40th Street Phoenix, AZ 85034. They offer a certificate of completion in construction trades: electricity as well as an associate in applied science degree in construction trades: electricity. At MCC you can earn your Electrical Technology – Electrician Certificate (ELTR)with a total of 37 credits. You’ll take courses in AC/DC Theory, Residential Wiring, Commercial Electricity and NEC Codes. They offer the program at their Bullhead City Campus: 3400 Highway 95 Bullhead City, AZ 86442. As an electrician you’ll get a lot of different benefits. One of the biggest is the use of a company truck. In Phoenix, Tucson, Glendale, Mesa and Tempe we found companies that offered new electrician either a truck or money per mile when using their own vehicle. Another benefit is health insurance and 401K as well as a tool allowance. As jobs become more plentiful companies are doing to great lengths to hire recent trade school graduates and even offering new hire bonuses. It really depends on the location where you are trying to work. Jobs in the valley are filled quicker but in Northern Arizona and deep Southern Arizona qualified electricians are in demand and companies have a harder time filling openings.